There are some books that seem to land in your life as if out of thin air. One day you think you’re all hip on the IT books for fall and the next it seems like everyone you know is talking about a book you had never heard of. And when that happens you feel like a fool. A fool, I say! 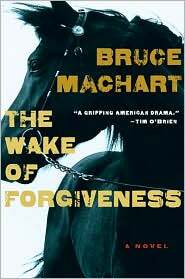 That book is Bruce Machart‘s The Wake of Forgiveness. It started out with Peter Geye mentioning it in his answers to the 6 questions (which is cute, when you got take a look at the answer to question #1 below). Then I got an email from JC Hallman who mentioned the book and the fact that Bruce had an upcoming reading at St. Thomas. This is why we’re letting Bruce Machart answer the 6 questions we always ask, even though he’s a Texan and this is an honor we have, up to this point, reserved for Minnesotans. Besides, any Texan willing to come up to Minnesota in November to give not one, but two readings, is a-okay in our book, right? First you can go see Bruce at 7:30 p.m. tonight at Magers & Quinn, 3038 Hennepin Ave. South, and if you can’t make that, you can go see him at 7:30 p.m. Thursday, November 4 at St. Thomas in Room 126, John R. Roach Center for the Liberal Arts. In the mean time, you can see how he answered our questions. I’m smack in the middle of Tom Franklin’s new novel, Crooked Letter, Crooked Letter, which is a wonderful literary mystery laced with Franklin’s lovely evocations of the kudzu-choked, cotton-flecked Mississippi landscape. On my bedside table, I’ve got Peter Geye’s Safe from the Sea and the new translation of Madame Bovary, both of which I’m chomping at the proverbial bit to dig into. Of course! Too many to count. I think if Elsie from John Casey’s novel Spartina (and from the long-awaited sequel, Compass Rose) were to walk into a bar (wearing those waders!) and take the stool next to mine, I’d be rendered speechless for the only time since the night my gorgeous fiancee first kissed me. It would be Richard Yates, reincarnated, inebriated, and mopping his mouth with a napkin after a bit of a Juicy Lucy at Matt’s Bar. Seems like it would have been his kind of joint. Where the Red Fern Grows. I must’ve read that thing 15 times as a kid, and I’m itching to read it with my son, but I’m worried I won’t be able to get through it again without breaking down. It still kills me. Anna Karenina. I don’t have much of a memory, so it would be a challenge. But just imagine! That would be a way to save sin, redemption, and the highest degree of art all at the same time. It would be a Godlike endeavor! Stendahl’s The Red and the Black. Great title. Plus, the dude’s got a syndrome named after him. Talk about making a name for oneself.